A carer is someone who provides unpaid support to a family member or friend. They may care for an older person, someone who is disabled, has a long-term illness, mental health problems or is affected by alcohol or drug misuse. Carers can be any age, from children to older people, and from every community and culture. Some carers may be disabled or have care needs themselves. What matters to people or the key elements of a personal outcomes approach apply whether working with people using services, with unpaid carers or families. However, outcomes for carers are different in some ways, and specific considerations arise in working with young carers and adult carers. We are pleased to be associated with the Eurocarers Research Working Group. This has enabled us to make the following connections, and have access to international resources to improve carer outcomes. Through the Coalition of Carers in Scotland we are associated with an ERASMUS project involving carer organisations in Europe, led by EPIONI in Greece. Learn4carers lasts two years from January 2019 and will enable exchange of best practices. The Care Alliance Ireland has produced a resource for family carer training, incorporating lots of free resources for carers and organisations, including online training for carers. We contributed to the seminar series which resulted in the resource and work from Scotland has been included in the resource. Earlier resources below address issues from identifying carers and supporting diversity, raising practitioner awareness of carer issues, through exploring the potential value of carers support plans, to supporting carer organisations to evidence their impact. An example of an outcomes focussed recording tool for carers is the Carer Pathway that was developed through multi-agency working in North Lanarkshire. Rebecca Caulfield, Training Co-ordinator (NHS Carer Information Strategy) carried out an evaluation of the ‘Think CARER’ training programme in NHS Lothian, which aims to support all local healthcare staff to be more carer aware. Alison Jarvis from NHS Lothian published an article in 2010 outlining the challenges to community nurses as they work with unpaid carers. Christeen’s digital story describes how thoughtful conversation with a professional during a carer’s assessment enabled her to see her life in Black and White, to recognise that she had locked herself into a role that was affecting her health, and to allow others including her family to help her. The story was created several years ago and has been used extensively at local and national events, but the core messages still resonate today. Research undertaken in Midlothian on outcomes focused carers assessment also highlighted the value of the conversation, together with the need for a strong action orientation, and makes key recommendations for practice. PROP Report 2013 (PDF: 5.3mb). 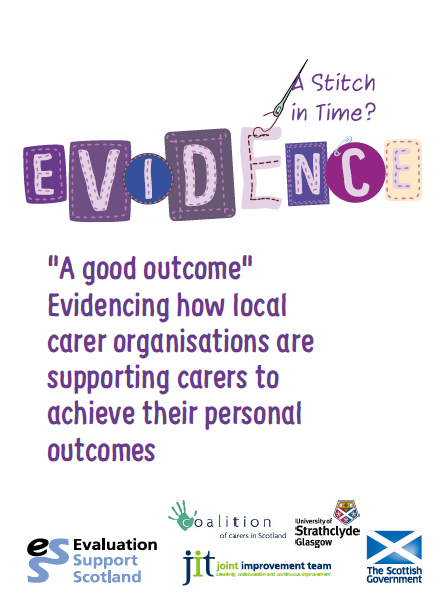 VOCAL (Voice of Carers Across Lothian) began to consider what ‘outcomes’ meant for unpaid carers several years ago. VOCAL was one of 8 partner organisations to take part in the Meaningful and Measurable project. Their final report shares learning about its evolving approach to engaging, recording and using outcomes information. Carers organisations play a vital role in supporting unpaid carers, but can find it challenging to evidence their impact because so much of the work that they do is preventative. In support of the Reshaping Care for Older People agenda, the Stitch in Time programme worked with eleven carers organisations to capture and further develop their evaluation approach, including the creation of a carer specific logic model. The project was taken forward by Evaluation Support Scotland and the Coalition of Carers in Scotland. As part of the project, a focussed literature review was udertaken to explore the wider evidence around carers outcomes and the impact of the caring role, selecting examples to illustrate short, medium and longer-term outcomes for carers, as outlined in the logic model for the programme.